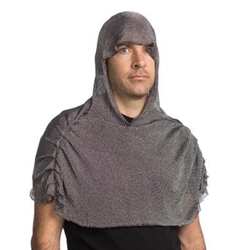 The Chain Mail Headpiece is a medieval style silver cowl. This headpiece comes in adult one size fits most. While a suit of armor would be effective at deflecting blows, it would greatly restrict movement. Therefore, many knights preferred chainmail for an effective level of protection, and vastly superior maneuverability. Complete the look with Medieval Gloves, Sword, and Shield!